A sign during the five-week government shutdown. The Office of Government Ethics just released guidelines for federal employees during government shutdowns, about three weeks after the government reopened. 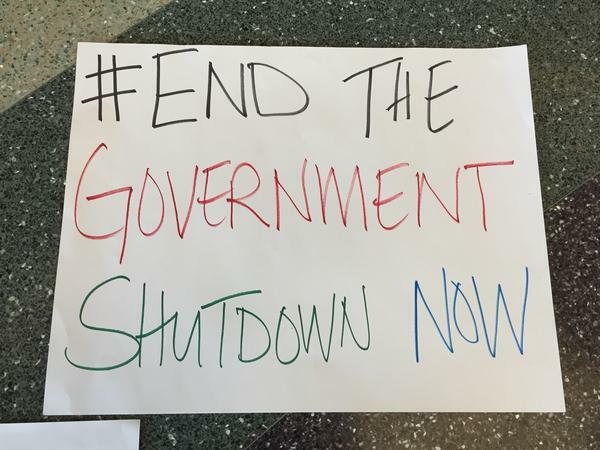 During the five-week partial shutdown, thousands of federal employees took to GoFundMe or other online platforms to fundraise for groceries, day care costs or mortgage payments. According to the memo, that’s a no-no. The memo also advises that employees considering work during a shutdown consult a government ethics official about the position. Federal workers generally aren’t supposed to accept work in the same scope as their regular employment. That can make it difficult for workers to find meaningful paid work during a furlough. The guidelines follow the longest government shutdown in history, which furloughed about 800,000 workers.